A must-have Disney World vacation accessory! 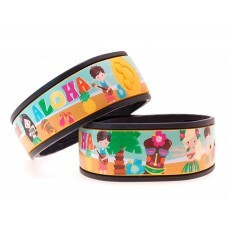 Recently I arranged with Tracy at Magic YOUR Band to review their MagicBand Skins. If you aren’t familiar with this product, these adorable decals attach directly to your Disney World MagicBand creating your own personalized look. Tracy asked me to pick out a MagicBand Skin that I liked as well as try out their online design tool for this review. My youngest son was excited to test the product with me so he choose the two piece “Slice of Pizza” design to go on his orange MagicBand. I decided to try putting my DisneyWorldEnthusiast.com logo on a skin for my red MagicBand. I was amazed at how easy Magic YOUR Band’s editing system worked. In a matter of minutes, I had a background selected and my logo in place and looking great! Then my son and I eagerly waited for our MagicBand Skins to arrive. Just as promised, they arrived in about a week. We opened our delivery to find our MagicBand Skins nicely packaged and looking gorgeous! The first thing that struck me was how bright and vibrant the colors appeared. Upon further inspection, the MagicBand Skins looked perfectly cut and well made. Next up was getting them on our MagicBands. The process was much easier than I thought it would be. I spent a few minutes watching the installation video on their site and then gave it a try. I found the skins to be very forgiving and I was able to lift them and adjust them until they were just right. Once I had the MagicBand Skins where I wanted, I went back over them pressing down firmly to make sure they were in place. It only took a couple of minutes until our MagicBands were looking quite magical! My son and I wore our MagicBands with the Magic YOUR Band Skins throughout a recent Disney World trip. They held up beautifully to ten days filled with pool time, attractions, and rain. We can’t wait to wear our new favorite Disney accessory on our next Walt Disney World vacation! MagicBand Skins are available for purchase on MagicYOURBand.com. They range in price from $6 to $8 each. They offer special pricing when you purchase multiple MagicBand Skins in one order. Buy two to five and save 15%. Buy six to nine and save 25%. Buy ten or more and save 33%. They come in one piece (that covers the center MagicBand Mickey) or two piece (that shows the center MagicBand Mickey) styles. They have over 100 ready-made designs available including adorable holiday varieties! You also have the options of personalizing one of their designs or creating your own with their easy-to-use online editing tool. MagicBand Skins are fully waterproof. They hold up in the shower, pool, and a Florida rain storm! The MagicBand Skins are easy to apply and remove if you want to change-up your look. They even have a handy video to show you how! The Skins have no effect on how the MagicBand works. Your band will still be fully functional. 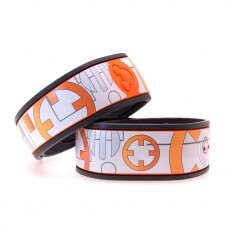 Magic YOUR Band is located in the United Kingdom and offers free international shipping on all orders. The average delivery time is 7 days from the date of postage. You can upgrade to 2 business day FedEx International Priority Shipping for an additional fee. Interested in getting a MagicBand Skin of your own? Well, you’re in luck! From now through Friday, August 12, 2016 at midnight, please enter daily to win a set of four Polynesian Luau MagicBand Skins. Just click the image below and follow the instructions to be entered into the giveaway. Be sure to take advantage of the bonus entries, and please tell your friends and family to enter too! Can’t wait and need a MagicBand Skin right away? Please click this link to purchase one today!